Comments: Works well in Alamosa, but note warnings. Best in natural areas along streams. Young bark is green. Provides large shade canopy. 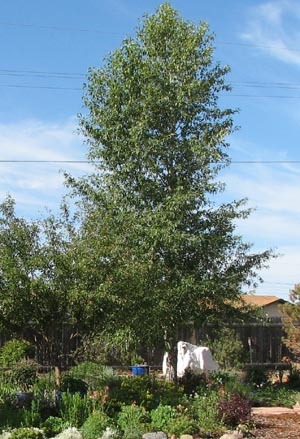 There is one called �Creekside� that has been grafted to P. acuminata rootstock (lanceleaf cottonwood) to prevent suckering. Warnings: Cottonwoods are notorious for suckering. Female trees produce vast amounts of cottony seed; nurseries only sell males. Some resources says doesn't sucker. Mine doesn't produce cotton but suckers like crazy. Street Tree? no Street Tree Conditions: Only for large spaces where suckers are not a problem. Known Locations: Many in Alamosa; Loser garden has one planted in 1997. Suckers like crazy around the garden. I would NOT replant!